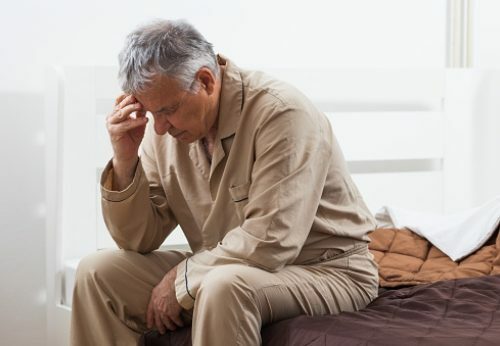 It is recommended by the National Sleep Foundation that seniors over the age of 65 aim for seven to eight hours of sleep, but for many this goal is hardly attainable. Many of us find it difficult to fall asleep or even stay asleep, so by the time we wake up we are tired and groggy and running on low energy. The National Sleep Foundation reported that 71 percent of people aged 50 to 64 experience some sleep problems. This means sleep issues are not merely age-specific conditions, but can start early on, too. Here are five common sleep problems you may encounter with each passing year. No matter how hard you try, you simply can’t stay up anymore. Worse yet, this causes you to wake up earlier. When we are in our 20s, our circadian rhythm is delayed, meaning we are “programmed” to stay awake and sleep in. As we get older, this rhythm changes, so we fall asleep earlier and are more alert earlier as well. Not staying asleep is a common sleep problem with age, and researchers suggest this has to do with changes in brain waves. By the time we hit 50, restorative brain waves do not spike as high as they did when we were younger, which means we can wake up much easier. Napping can combat this, but be mindful – too much napping can disrupt your circadian rhythm, so save it for those days when you are really drained. Nearly 53 percent of seniors have to urinate during the night hours, and this urge is increasing with each passing year. Nighttime urination could be a natural sign of aging, or it could signal a health issue like diabetes or a prostate problem. If nighttime urination is keeping you awake, speak to your doctor about your options. Snoring doesn’t necessarily mean you are in a deep sleep. In fact, it could signal obstructive sleep apnea – a sleep disorder in which a person stops breathing momentarily numerous times a night. The good news is, your doctor can confirm a diagnosis of sleep apnea through a sleep test and prescribe a CPAP device, which helps prevent the stoppage of breathing. As you age, your risk of restless leg syndrome increases. This is a condition in which the legs are restless and feel as if they need to be in motion due to tingling or crawling sensations. There is still much to uncover about RLS, but speak to your doctor if you suspect you have the condition, as there are treatment options that may help. Make the bedroom a sleep zone – ensure it is of proper temperature, dark, that your mattress and pillow are comfortable. Avoid afternoon naps – napping can keep you alert at night. Keep naps to a minimum and try not to nap close to bedtime. Don’t drink alcohol before bed – although alcohol makes you feel drowsy it actually disrupts your sleep cycles. Drink less fluids at night – drinking prior to bed may prompt you to wake up to use the bathroom. Wear yourself out – performing an activity that makes you tired may help you fall asleep. Get some sun – getting sunlight lets your body know when it should be awake, so when the sun sets your body will produce melatonin to help you fall asleep. Although these tips are helpful in promoting sleep, if they don’t work you may have an underlying condition that is disrupting your sleep. Don’t hesitate to see your doctor about your sleep troubles so you can get your good night’s rest yet again.